Register Log In AmbergrisCaye.com Home Forums News John Briceno On ICJ: Yes, No, Maybe? Belize's national referendum on April 10th. is inching closer, and, pretty soon, all of us who are registered to vote will have to decide YES OR NO to taking Guatemala's territorial claim to the ICJ. Since last week, we know it's a "NO" for the PUP - but what about its leader, John Briceno? From late last year, he said publicly that he is in favour of going to the ICJ, but last week, under severe internal pressure from his party, he had to send out a statement declaring a hardline "no". Briceno's press release went even further, making it clear that the former PUP Ministers, Lisa Shoman, Assad Shoman, Godfrey Smith, and former Prime Minister Said Musa do NOT speak for the PUP. 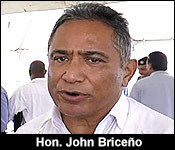 Briceno was quoted in the release as saying, "I am sufficiently convinced that an overwhelming majority of our Party members and supporters are going to say NO and as the leader of a mass party, that makes decisions in a democratic way, I have an obligation to accept the views of the majority. I am certain that in the final analysis our Party will say NO to the ICJ." End quote. "I have been all across this country. This week, I am going to finish the Orange Walk District. Today, I am going to be in Cayo South Belmopan, and on Friday, I am going to be in San Pedro, and that then will wrap up the entire listening tour that I've been on. And So far, wherever I go, I think that people have been expressing great concerns about the referendum. And there are different varying degrees of no. Some are saying outright no, we don't believe we should be going to ICJ, but a lot more people are saying, we don't have enough information. We don't think we're ready to hold a referendum, and because of that they believe that the Government should change. And if they don't change the date, they believe that they should vote no on the 10th of April." "We've heard your formal position. What is your personal position on it?" "Well, I think that is on record. I think what is more important is that I am the leader of a party, and as leader, I should listen to the people, and to our supporters. And these are the things that they are bringing up, and these are the concerns that they have. As such, I think I'm supposed to reflect their concerns about the referendum on the 10th of April. Our party and many organizations are going to take a position of whether to go or not to go. But, when you go in that polling room, that is where then you will make a personal decision as to what you think is in the best interest of Belize." "So, if I were to ask you, Mr. Briceno, how will you vote?" "Well, I don't think it's any of your business. (chuckles) I'm sorry, I shouldn't have said that. But, more importantly, I think that I have Personal John Briceno and John Briceno party leader. Right now, I am speaking as the party leader, and the only reason you're speaking to me is because I am the party leader. If I was citizen John Briceno, you would not be speaking to me right now. My party believes as - the way it is going right now, they believe that going to have a referendum on April 10th is not right thing to do at this time." "Is it disheartening to you for one who believes in a yes vote, that Belize may very well say no out of emotion?" "I think what is more important is that we need to decide what is it that we want. Do we want to just hold a referendum because you are the boss, and you say we're going to have a referendum? Or do we want to get it right? And to get it right includes many things. It includes a proper, balanced, extensive and intensive educational campaign, which has not taken place. It requires amendments of several laws that we have in Belize that has not taken place. It requires us to have a good understanding as to how much exactly it's going to cost us, and where that money is going to come to go to the ICJ. And these are just some of the issues that I think that we need to answer. So, to me, it is unfortunate that the Government has decided that come hell or high water, they're going to have a referendum on the 10th of April." "I think what is more important is to point out - and they quickly mentioned it - that they are not speaking on behalf of the People's United Party. They're speaking as private citizens and former foreign ministers, and that is their right to do so. And that has been clearly articulated over and over. They were there as private citizens, and not as the party. The party speaks with 1 voice, and the press release that we sent out last week was just a preview as to what is going to come. I expect to wrap up the listening tour next week. Next week, I will meet - we're almost at 31 standard bearers - we're going to meet with them, and then, we go to the national executive for a declaration. And then after that, we will have a national party council." "Sir, do you agree with Eamon Courtenay's description of the event. He said it was a circus; it was a political stunt." "Well, we know that it was a publicity stunt. The government is desperate in trying to turns of the Belizean people, and they felt that by having all the former foreign ministers come together, that it can help what they're doing. And that's fine. That is their decision. They decided to do so, and I have no quarrel with them over that." "But, these are senior people of your party, all senior counsels too. Has it divided the party any?" "They would tell you that they do not speak for the party. Godfrey Smith, Assad Shoman, Lisa Shoman, they are no longer active in the PUP. The only one is yes, the former Prime Minister, who is a sitting member of the House of Representatives. But, they felt that they needed to make their position known, as former foreign ministers, not as members of the People's United Party."